Both fish and meat provide healthy nutrition, but both also come with health caveats. Meat and fish, along with poultry, are the best sources of protein and iron. Both have a place in a healthy diet, but cutting down on red meat and increasing fish may improve your health. Protein is made up of amino acids, the building blocks for tissue, skin and muscle. Twenty amino acids, 10 of which can only be obtained from dietary sources, make up the complex molecules of protein. Both fish and beef are excellent complete protein sources, meaning they contain all the essential amino acids. A 6-oz. serving of steak, for example supplies 38 g of protein while the same size portion of salmon contains 34 g of protein. You need around 60 g of protein daily for tissue building and repair, or 0.8 g per 1 kg of body weight. Fish has the definite edge over beef when it comes to fat content. Red meat contains a larger amount of fat than fish, and the fat in red meat is mostly saturated fat, the type most harmful to cholesterol levels. Saturated fats raise low-density lipoprotein levels, the so-called "bad" cholesterol. A 3-oz. serving of 75 percent lean ground beef contains 15 g of fat compared to 4 g of fat in the same amount of salmon. Beef sirloin, a leaner cut of meat, contains only 7 g of fat per serving; choose lean cuts of beef whenever possible. 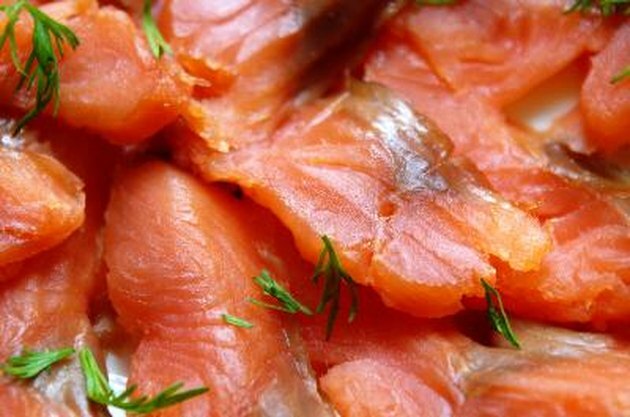 Fish, like salmon and other large, coldwater fatty fish contain large amounts of omega-3 fatty acids, unsaturated fats that benefit the heart rather than increasing the risk of heart disease. Iron is essential for transportation of oxygen through the body. Iron comes in two forms: heme and non-heme, with heme iron being the best absorbed. Animal-based food sources supply heme iron, while plant sources supply non-heme iron. Both beef and fish supply heme iron, but beef supplies slightly more, with 2.7 mg of iron per 3-oz. serving, compared to 1.1 g for fish. Both fish and beef come with health caveats. Because the oceans and lakes are contaminated with pollutants, some fish contain large amounts of mercury or other pollutants, such as dioxin. These contaminants can be harmful to people -- pregnant women and small children in particular should avoid consuming certain fish completely, including albacore tuna, king mackerel, shark, swordfish or tilefish, and should limit other fish consumption to 12 oz. per week. An October 2005 report by the American Cancer Society in "CA" reported that eating more than 3-oz. of red meat per day increased the risk of developing colon cancer. Eating processed meats and charbroiling increased the risks.